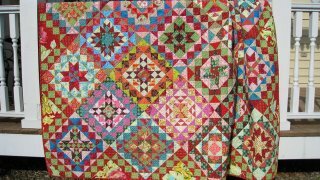 On Patty's blog, she showed a picture of her quilt. A lot of questions were asked by numerous people "Where did you get that pattern?" Unfortunately, she couldn't answer the question, because she gave me the book. The book is called "Better by the Dozen" by Susan Teegarden Dissmore. I saw the quilt in person when I quilted it and it is absolutely stunning! Well done Patty, another great color masterpiece!